The meaning of the claddagh ring is embedded in its main features and what an amazing jewel it is. History tells us about priceless jewels that were acquired by plundering lands but, rarely do we hear about a jewel that was created purely out of love and loyalty. The essential features of a claddagh ring are the heart, hands and crown - basically there is no claddagh ring if any of these elements are missing. The heart symbolizes love, the hands signify friendship and the crown promises loyalty. A humble fisherman named Robert Joyce from Ireland is credited with making the first claddagh ring. Young Robert was among a group of fishermen who were captured by pirates and sold as slaves. He was sold to a goldsmith and forced to learn the craft from his master. Robert Joyce tried to keep up his morale despite, being exposed to the depressing life of a slave. He longed to be reunited with his beloved who lived in the same fishing village. He made the ring hoping that its features would showcase his true feelings for her. He was released from slavery a few years later, he rushed back to his village. Ring in hand, Robert kept looking for his beloved - he was absolutely delighted to see that she had been patiently waiting for him for all those dark years. He gave her a ring and the couple were soon married and set up family in the village. Interestingly, the name of he village was 'Claddagh' and that is where the ring got its name from. The narration dates back to around 4 centuries, historians generally seem to agree that the story is true. The ring retains all features present in the first ring made centuries ago. 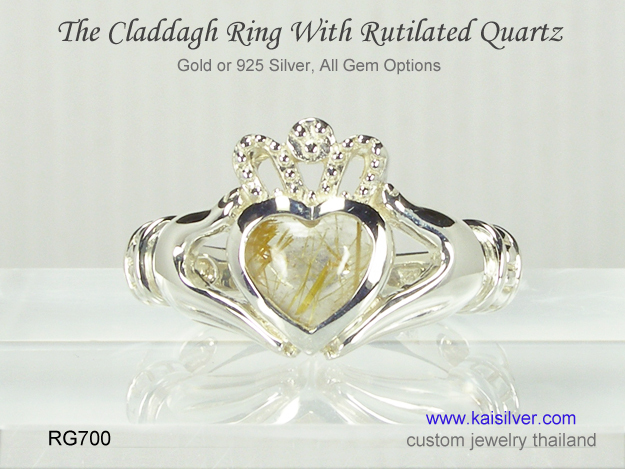 Kaisilver custom makes claddagh rings in gold or 925 sterling silver. 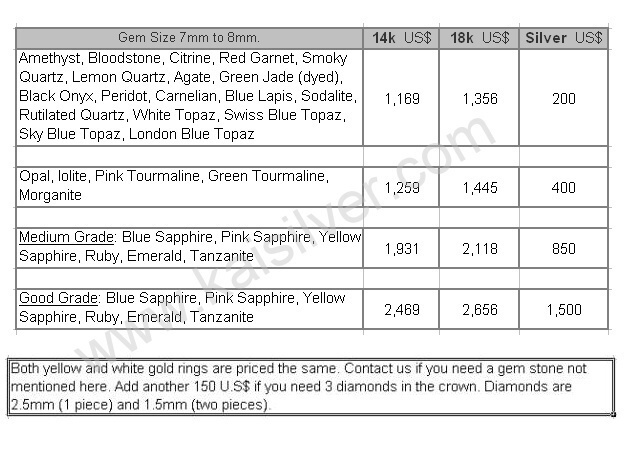 You can choose the gemstone of your choice when ordering. We craft claddagh rings for men and women in silver or gold. Each ring is crafted by highly skilled jewelry artisans. 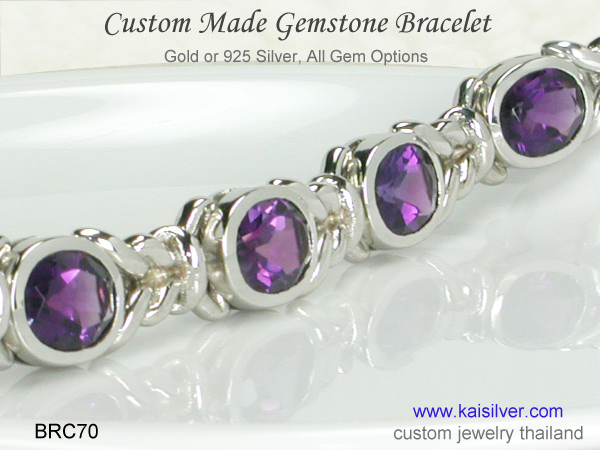 Every gem is handpicked and custom cut, gemcertification is available. 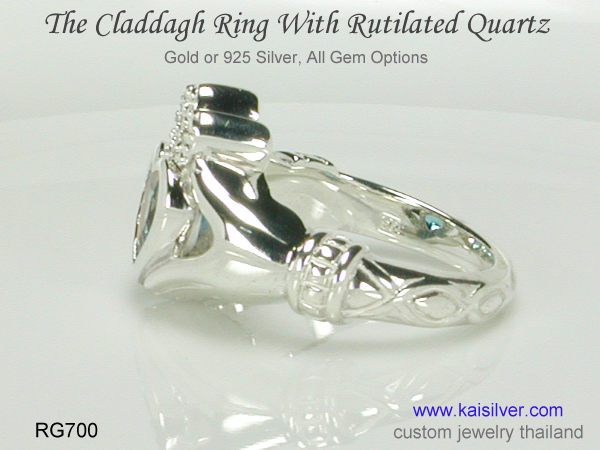 The Kaisilver claddagh ring is backed by months of research and study, the jewel is widely accepted as the world's best rendition of the claddagh ring. Our team of talented designers have ensured that, every custom made claddagh ring retains the entire meaning of the first ring. Remember that the ring was originally made about 4 centuries ago. We initiated the practice of setting a center gemstone in the claddagh ring. Our stylists are of the opinion that the gemstone not only adds beauty to the ring but also, increases its meaning. The RG700 is a stupendous jewel, it pairs the 400 year old legend with one of the most unique and intriguing gemstones of all time. This claddagh ring is set with a rutilated quartz gemstone, this is a rare gem which is treasured specifically for its inclusions. Any gemologist would tell you that, inclusions in a gem detract from its value and beauty. The gem in this claddagh ring, has fine rutile needles in the form of inclusions. Scientifically explained, the rutile needles were lying in the vicinity where, quartz was being formed. The fine rutile pieces could have got blown by the wind and broken into pieces. The fact that they got included in the quartz formation meant that, they remain preserved for millions of years. How To Buy: To begin with we do not recommend a 'Buy Now' or 'Express Buy' attitude when it comes to high end jewelry. You deserve more, than a mechanized website and automated servicing when you are paying for fine jewelry. 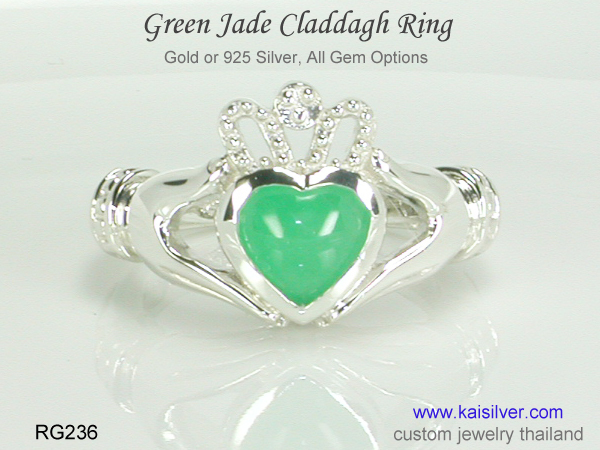 If you wish to buy a claddagh ring or any other jewel from Kaisilver, email your requirements to our team of experts at sales@kaisilver.com . Provide as much detail as possible regarding your requirement, we will get back with suggestions, options and a price quote. We craft all types of jewelry in gold or silver with no limitation on gem selection. You could even send us your own design sketches or images to be custom made.